Well, here I am again with another Snapware review. 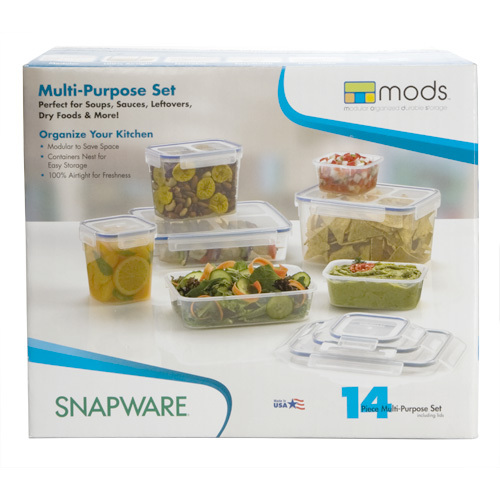 Today I am going to tell you guys about the Snapware 14 Piece Airtight Food Storage Set. These were really needed around my house. We ALWAYS have leftovers, and if no one can find a matching bowl and lid, then, well, they just get thrown away. I have been getting so frustrated at the amount of food we have been wasting, so these were perfect for us! These storage containers were really helpful! I love the fact that they can all be stacked inside each other to save space! They also have made it really easy to find the right lids. Each lid has a design on it that matches the base. For example, if the lid you are using has 4 squares, you just look for the base with 4 squares and match them right up. As a mommy, I of course like the fact that they are BPA free. They also snap down on all 4 sides, which makes for a very tight seal, which is a must. I hate storage containers that you can't really tell if they are closed or not. These are so nice to have, we have been using the heck out of them! To check out Snapware's extensive line of home organization products, just click here! 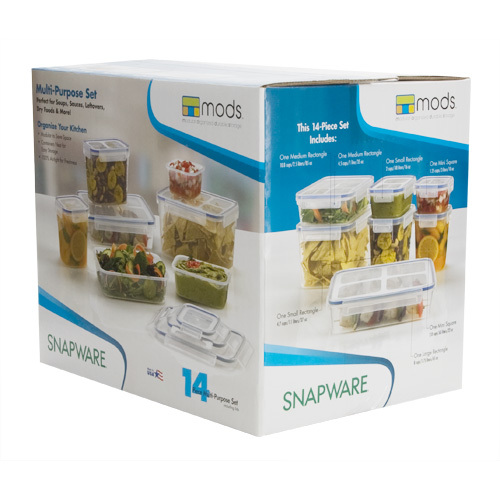 *UPDATE: Do you wanna win this 14 piece airtight food storage system from Snapware?? disclosure: i was provided with a sample product in order to conduct this review. Although I received a product, all opinions are my own, and no monetary compensation was given. I would like to have the 4.1 Cup Pet Treat Canisters. I would like the X-Large 2 Layer Ornament Box with Cardboard Dividers. 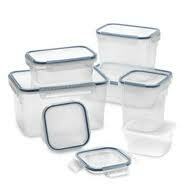 I would like the Glasslock 4 Piece Rectangular Airtight Food Storage Container Set. I like the 2 Layer Cookie and Cupcake Carrier. A product of theirs I'd love is the 2 layer ornamant box. I would love to have the 17.1 Cup Pet Treat Canister. I would love to have the Snap 'N Stack Small 3 Layer Square with One Divided Tray! I entered your Snapware Giveaway #3 ! I really need the Snap 'N Stack X-Large 2 Layer Ornament Box with Cardboard Dividers. I'd like the 17.1 cup pet cannister. I like the make a gift ones.Thanks for the chance. I would like the 2 layer sandwich box. I follow Snapware on Twitter @mgoss123. I entered the Snapware 10 piece cannister set giveaway. I entered the Soy Candles giveaway. I love the idea of the Yarn-Tainer. I like Snapware on Facebook, and I told them you sent me! I would also like the cupcake holder and cereal container. Price: $7.99, I love the shape and it would look great on our kitchen counter filled with yummy cookies. Liked Snapware on FB and told them you sent me. Love the two layer ornament box. I like the small holiday storage container. I'm glad these are BPA-free! I entered your Snapware Cookie carrier giveaway. I also like their 10 piece canister set. Entered the Umi Shoes giveaway.